Tender slices of juicy chicken and seasonal veggies get tossed with bow-tie pasta and a creamy, cheese-y alfredo sauce. Alfredo is one of those dishes I start to crave as the air cools down. A creamy sauce mixed with a generous portion of parmesan cheese tossed with pasta is the perfect stick-to-your-ribs kind of meal I look forward to in the fall and winter months. It’s a dish I can get cozy with on the couch in an over-sized sweater, wool socks, and my favorite throw as I watch the leaves fall from the trees and the birds happily bouncing at my outdoor feeders. This Chicken Alfredo Primavera is loaded with slices of hearty chicken, my favorite veggies, bow-tie pasta, and gobs of parmesan cheese. It all comes together in 30 minutes, making it the perfect weeknight meal to serve after a long day of working and carting the kids around. Since most every child–and adult–loves pasta tossed in a cheese-y sauce, there will be no whining at the dinner table. 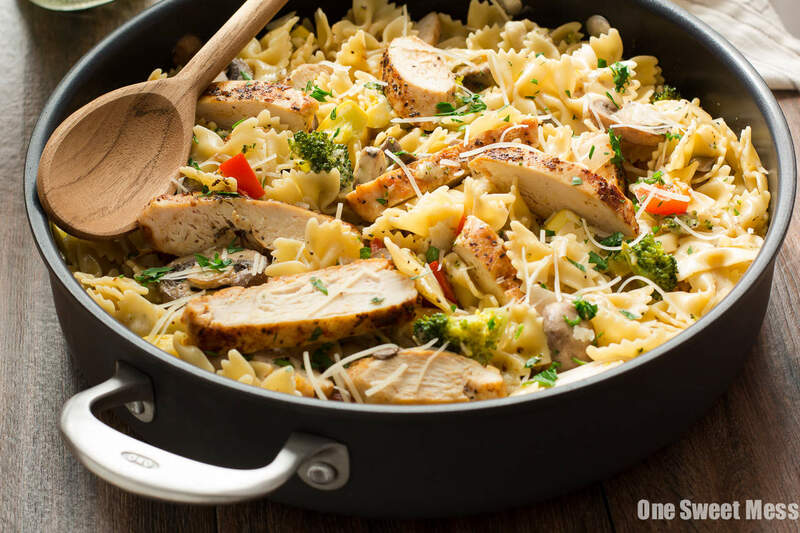 I like double the chicken when I’m making a batch of alfredo, so I picked up a pack of PERDUE® Perfect Portions Boneless, Skinless Chicken Breasts. Each pack includes 5 breasts, amounting to 1.5 pounds. They come individually wrapped, which I love since we’re a family of two and don’t always use all the chicken that normally comes in a pack. I can take out what I need and store the rest in the freezer without having to unpack and divide the remaining portions into freezer bags. The work is already done for me. This recipe will feed a family of four but can be easily doubled if you’re serving a larger crowd or would like leftovers (yes, please!) to take to lunch the next day or to serve throughout the week. If you’re planning ahead, this recipe can also be doubled and packaged in freezer-safe bags and stored in the freezer for up to 3 months for those days where you just don’t feel like cooking but want a home-cooked meal. Now that my father-in-law is retired, Squirrel and I will be hosting dinner at our house every other week. Since I love feeding others, I thought it would be fun to have everyone over for a big, home-cooked meal. When it’s my turn to host, I’ll be doubling this recipe to serve at our next family gathering. Heat 1 tablespoon of butter and 2 tablespoons of olive oil in a large skillet over medium-high heat. Season both sides of each chicken breast with seasoned salt and a pinch of pepper. Add the chicken to the skillet and cook for 5-7 minutes on each side, or until cooked through. While the chicken is cooking, bring a large pot of water to a boil. Season the boiling water with a few generous pinches of kosher salt. Add the pasta and give it a stir. Cook, stirring occasionally, until al dente, about 12 minutes. Reserve 1/2 cup of pasta water before draining the pasta. Remove the chicken from the pan and transfer it to a cutting board; allow it to rest. Turn the heat down to medium and dd the remaining 1 tablespoon of butter and olive oil to the same pan you used to cook the chicken. Add the veggies (minus the garlic) and red pepper flakes to the pan and stir to coat with the oil and butter (refrain from seasoning with salt until the veggies are finished browning). Cook, stirring often, until the veggies are tender, about 5 minutes. Add the garlic and a generous pinch of salt and pepper to the pan and cook for 1 minute. Deglaze the pan with the white wine. Continue to cook until the wine has reduced by half, about 3 minutes. Stir in the milk, heavy cream, and reserved pasta water. Bring the mixture to a gentle boil and allow to simmer and reduce for 2-3 minutes. Turn off the heat and add the Parmesan cheese and cooked pasta. Season with salt and pepper to taste. Garnish with Parmesan cheese and chopped parsley, if desired. Disclosure: Thank you to PERDUE® for sponsoring this post. All opinions are 100% my own. Thank you for supporting my site while I work with brands I use in my kitchen. Next time I have dinner with my sister, I’m totally making this! She’s oooobsessed with chicken alfredo, and that chicken looks cooked to perfection!! Look at this – LOVE. Great recipe and I love how easy it is to make. Yum! Love that creamy sauce and all the veggies, such a creative pasta dish! Love everything about this – pasta, chicken, veggies, easy. Doesn’t get much better! Such a comforting dish. It would definitely impress a crowd! Love this! I could eat it every night! You’re so right, who doesn’t love alfredo? I love that you snuck some veggies in here for us, too ;) And the Perdue Perfect Portions sound PERFECT (ha) for a family of two! So convenient. looooove this pasta! It’s a full perfect meal!